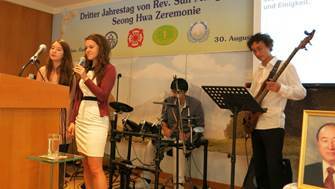 On Sunday, August 30th, the Vienna community of the Unification movement gathered for the celebration of Rev. Moon’s third Seong Hwa Anniversary. The event had been announced to all the Peace Ambassadors and guests of UPF and WFWP as well. The day before the event the two halls of the Headquarters of the Unification Movement were carefully prepared for the event. Finally on Sunday we could welcome more than 200 participants – 150 members and 50 guests! 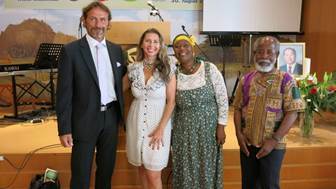 At the celebration Dr. Fuat Sanac, the President of the Muslim community of Austria, gave congratulatory remarks. He has been a friend of our movement since several decades and values True Father’s teachings and achievements. The second speaker was Mag. Harald Janisch, founder of IIFWP in Austria, who went into politics some time ago. He thought that day was appropriate to thank True Father for the encouragement he got for his work and all he could learn from him. He intends to fight for family values and the spirit of global citizenship within the framework of his political party, he stated. Mrs. Elisabeth Cook, Vienna Family Federation pastor, led through the program. She made the connection to the international and Korean events which led up to the worldwide 3rd anniversary Celebration like Peace Road, the Universal Peace Choir, The Summit Meeting and the Suhak Peace Price. The second topic she mentioned was True Father’s teachings and vision for the family. The main address was given by UPF President Peter Haider. He started by quoting Mahatma Ghandi “Be the change you want to see” and John F. Kennedy “Ask not what your Country can do for you, ask what you can do for your Country” while showing the connection to Rev. Moon’s “Living for the Sake of Others”. By sharing a few personal experiences with True Father in critical situations he could explain how difficult it was initially for the Christian world to accept Rev. Moon as True Parents and as the Messiah, but that inspite of all obstacles they were able to embrace all people, including even their worst enemies. He also made a point that Rev. Moon was not acting in the blue sky but was laying foundation on foundation building up a movement so that finally more and more leaders of main stream institutions are following them. 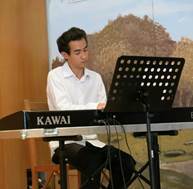 The Vienna music team created a beautiful atmosphere through the music, which included the solo “Amazing Grace”. 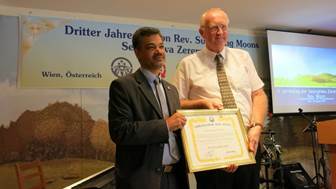 Finally, the “Ambassador for Peace” award was given to DI form the Austrian-Jordanian friendship Organization. After the official program everybody was invited for lunch, which had been prepared by members of the Family Federation. Everybody was very happy.